Extra Rubber Grippers, sold in sets of 10 pieces. Need extra grippers? Here they are! Set of ten rubber grippers for use on the base of pegged glass votive holders. These grippers are opaque, and help secure peg-base votive cups in the sockets of standard candle holders. Sized to fit pegs for 7/8" diameter candle sockets. Item received was what we needed. It was very hard to find these parts elsewhere. I recommend any one that needs the rubber grippers to check with your company. A little thicker than the originals, but these are a quite workable replacement for the rubber grippers on our old peg candles. These are wonderful and such a great idea. 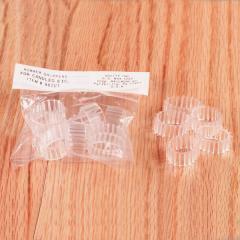 Q: Are these rubber grippers clear, as shown? A: The grippers are slightly opaque. The flash used in the photo does make them appear to be a bit more clear and shiny than they are. A set of ten replacement rubber grippers for use on pegged votive glasses.